This Infiniti EX35 is among the most stylish and best-performing luxury crossover in its class. 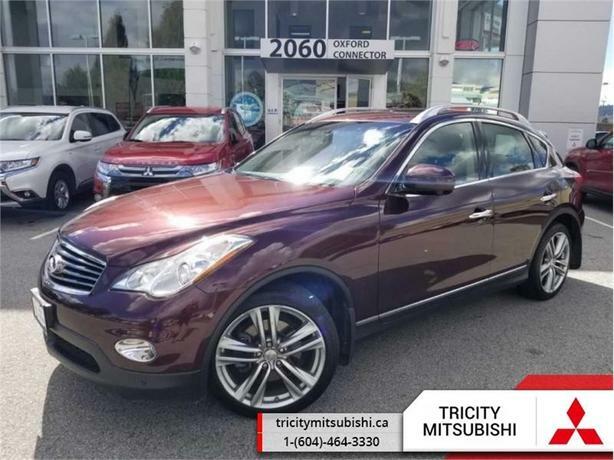 This 2012 INFINITI EX35 is for sale today in Port Coquitlam. Poised with an intimately tailored interior and technologies engineered to intuit your needs, this Infiniti EX35 is designed to be the ultimate expression of you, the individual. Every thoughtful detail seems to have you in mind even before you enter the vehicle. An impressive V6 engine delivers energizing performance while you ride in comfort. With a stylishly sleep, coupe-like exterior attracting all the right kind of attention, your EX35 won't be the only one seeking a closer connection with you. This low mileage SUV has just 43779 kms. It's nice in colour. It has an automatic transmission and is powered by a 297HP 3.5L V6 Cylinder Engine. This vehicle has been upgraded with the following features: Leather Seats, Rear View Camera, Heated Seats, Siriusxm, Aluminum Wheels, Steering Wheel Audio Control.